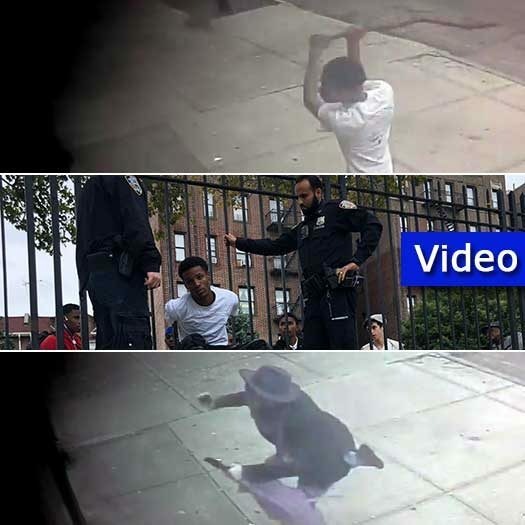 Crown Heights assailant who viciously attacked a man in Crown Heights, had his hate crime charges dropped by a grand Jury. 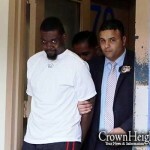 The Friday arraignment of the assailant who viciously attacked a man in Crown Heights, ended with the dropping of the hate crime charges in the attack on the community member. As previously reported on crownheights.info, the incident occurred at around 3:50pm at the intersection of Empire Boulevard and Albany Avenue. 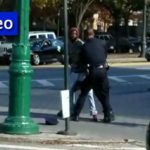 The victim was accosted as he was crossing the street by a black teenager carrying a wooden stick. When the victim realized he was about to be assaulted he attempted to flee. The victim ran into the cleaners owned by R’ Shloime Junik, whose son tried opening the door to provide shelter to the victim, though not fast enough. The attacker managed to swing and strike the victim over his back and shoulder causing the stick to break in half. The perpetrator then threw the second piece into the store and striking both the victim and another bystander and causing further injuries. Attempting the flee, the suspect ran down Albany Avenue into Lefferts park with multiple witnesses chasing after him. Both Shomrim and police were called and the suspect was apprehended, police arrived a short while later and arrested the suspect. Much to the shock of the people observing the suspect being arrested, officers said that he had just been released less than 30 minutes earlier after he was caught shoplifting from a bodega on Rutland Road and Albany Avenue. He was released on a desk appearance ticket for that crime. Although he will not be facing hate crimes charges, he is still charged with felony assault, menacing, harassment, criminal possession of a weapon. If we voted, the politicians would make sure that it wouldn’t be dropped. No one’s too important or too busy to vote! He looks more like a crack head than a hater. 100% that’s the only way such people will learn! … for the wrong people. We are blindsided by self proclaimed community leaders who thrive on photo ops, who bring goyim into a holy sukka, and stand on the steps of various venues decrying the violence to the Jews. But they never go into the public schools and churches to preach morality, to condemn violence and substance abuse. They only smile and pose for pretty pictures and you fools follow blindly and vote for them! Vote Republican. Stop the abuse of innocent men women and children! The point is to show people the consequences of not voting. You didn’t get that? If everyone voted, the politicians would take us seriously and our streets would be safer. I guess to you that’s “bombastic ignorance”. The Grand Jury decision had nothing at all to do with voting, the D.A pressed for the elevated charge, the Jury declined to indict. We do have a get out the vote problem in this community. Our community organizing is run by incompetents. We have to buss our population to the polls like the goyim do, instead we get a flier with goy on the front which most of us correctly ignore as spam and the people you are berating aren’t reading the local website comment sections lol. If they felt they needed our votes, you could bet your bottom dollar they’d make sure a hate crime charge remained. As for your last point: of the 90% of CH residents who are too lazy to vote, there are plenty who read comments. Yeah…nope, you’re just wrong. You don’t understand how the grand jury works, and that’s okay. This isn’t a morality issue. CH isn’t too lazy to vote, you’ve elderly people who don’t understand the system, and you have people for whom English is a second or third language, and you have people who correctly pay zero attention to the news. You know what you do to get such people to vote? Yeah, you arrange for transportation, you bring them to the polls and you tell them what to check off. It’s called a get out the vote drive, and ‘community organizing’ and the democratic machine has it down to a science. Our community ‘leadership’ just isn’t up to the task and they likely can’t be replaced. This is no laughing matter, so leave your “lol” for someplace else. We could have had decades of proper representation for our community. But most residents don’t care about it and threw that possibility away, and keep doing so (every municipal/local, midterm, and presidential election). Yeah, you know who doesn’t say that…the blacks, they understand reality, that you simply cannot expect a critical mass of people to breath politics and reliably vote, in things like the state democratic primaries… so they community organize, meaning to say they bus their chevra, feed them if need be, probably pay them if need be, and get them to vote. They don’t put a token flier and photo op article the week of the election and consider themselves done with it. They work hard and get it done. I’ll tell you a story, I went to vote in this past election and I was turned away because I’m not a registered democrat. It was a primary…I get it. 1) CH Jews are not inspired to vote, when the CHJCC hasn’t had elections in …how many years ? 2) so…how bout shaming members of the CHJCC until they hold elections ? didn’t this happen before some years ago as well ? 3) Why aren’t there quarterly public meetings of the CHJCC for public questions and input. We keep saying to vote but most of us dont know who to vote for maybe someone should step up to the plate and educate the jewish community as whom to vote for..
supposedly he has psych issues…or at least that is what PD said…so why give him a DAT on the first place? put him thru the system and get him help.